The Coat of Arms of the Bishop of Shrewsbury consists of some of the most striking imagery of any crest of the Catholic Church of England and Wales. An inverted leopard’s head with a fleur de lys is borrowed from the emblem of St Thomas Cantilupe, the 13th century nobleman and Bishop of Hereford who sought to emphasise that as a follower of Jesus Christ he had decided to reject violence and warfare in the pursuit of peace. The image of the leopard is superimposed over the red cross of St Chad, a monk, priest and the 7th century Bishop of Lichfield, which is, in turn, mounted on a sword and shield. Both St Thomas and St Chad have historical connections to Shrewsbury because the diocese is formed from territory previously served by the ancient Dioceses of Hereford and Lichfield. 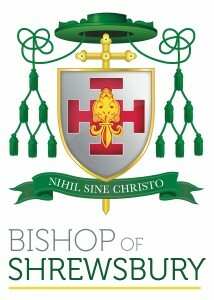 The green hat and tassels denote the office of a bishop and the words “Nihil Sine Christo” (Nothing Without Christ) is the personal motto of the Rt Rev. Mark Davies, the 11th Bishop of Shrewsbury.